David Paterson has spent 30 years in the mining industry, working and living in Australia, Europe, Asia and Africa. 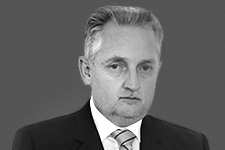 David has considerable expertise in managing the reputations of companies facing significant reputational challenges. From 2014-16, he was Vice President Local Economic Development at Konkola Copper Mines, in Zambia at a time when the mining sector was under considerable political challenge. From 2010 – 2012, he lived and worked in Mongolia as Vice President Communications and Regional Economic Development while Rio Tinto was constructing the Oyu Tolgoi copper-gold mine in the Gobi Desert. This mine is the largest investment ever undertaken in Mongolia. From 2004-2010 he was General Manager Strategy and Communications at Energy Resources of Australia (ERA) in Darwin. ERA was Rio Tinto’s Australian uranium subsidiary and owner of the contentious Ranger Uranium Mine and Jabiluka uranium deposit. Mr Paterson has an economics degree from Monash University and an MBA from the University of Melbourne. In addition to corporate affairs and communications roles, he has a strong background in mineral economics and financial evaluation.